Exodus 26:31–37, A veil. The veil or parochet divided between the holy or set-apart place and the holy of holies or most set-apart place. It was woven of fine linen of the same four colors as were the previous two curtains—blue, crimson, purple and white, except this veil had cherubim embroidered into it. The most set-apart place is a picture of returning to the Garden of Eden, which had cherubim guarding its entrance (Gen 3:24), except this time it is the New Jerusalem in the New Heaven and New Earth. It was this same veil that was rent from top to bottom in the second temple in Jerusalem at the time of Yeshua’s crucifixion (Matt 27:51). The writer of the Epistle to the Hebrews teaches a correlation between the tearing of Yeshua’s flesh on the cross and the tearing of the veil, and that this event opened the way for believers to be able to enter into the most set-apart place and to come boldly before the throne of Elohim through the shed blood of Yeshua (Heb 10:19–22 cp. 4:14–16). This veil to the most set apart place (also known as the oracle or deveer) contained the four colors of the other two veils: crimson, blue, purple and white. Unlike the others, this veil had embroidered cherubim on it. It hung on four pillars of overlaid gold acacia wood. The pillars were set in bases of silver with the curtain hanging by rings of gold. This veil is what separated men from the very Presence of Elohim. At Yeshua’s death the veil in the temple was split from top to bottom (Matt 27:51) opening the way to all into the holy of holies by and through the redemptive work of Yeshua on the cross (Heb 10:19–22). This entry was posted in Weekly Scripture Readings and tagged Holy of Holies, Tabernacle of Moses, The Veil by Natan Lawrence. Bookmark the permalink. does this mean we can enter into the Father’s presence with out the Son? we will no longer need a high priest in the kingdom? No need for a mediator? The pattern of the tabernacle changes? I have so many questions on this one. In my article, I clearly state that the way into the holy of holies representing the throne of Elohim is through the blood of Yeshua. The book of Hebrews clearly states this and I give the references. Not sure where you’re getting the idea that I infer otherwise. I wasn’t implying you said anything. It wasn’t about you. I was only trying to understand what you were saying. I have always believed Yashua died to save us from the second death. I never gave thought to the idea He died so we would ever enter into the holy of holies because no one but the High priest ( who Yashua now is) was able to do so. And because I was taught Gods word never changes it was still the same pattern so to speak. In other words what I understand could change tomorrow because The Ruach is ever teaching me new understanding. So i was seeking answers. The Aaronic high priest and his activities (including going into the holy of holies on Yom Kippur) was simply a prophetic picture that pointed to Yeshua who, as the Epistle to the Hebrews points out in great detail, fulfilled once and for all the role of the high priest and is now our Great High Priest in heaven. 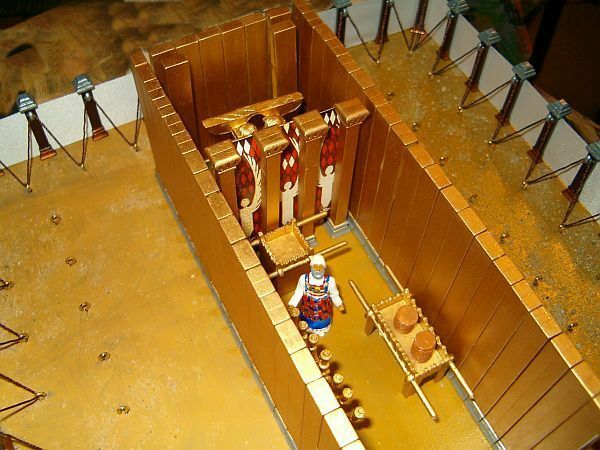 Everything in the Tabernacle of Moses was a symbolic and prophetic prototype or ante-type of something relating to the gospel and Yeshua. Hebrews really explains this well. It would be worth reading this epistle again with this idea in mind. Blessings. So then the question becomes “if His role is fulfilled and the veil is torn and we can now enter into the presence of the Father what is His role going to be? The article made it sound like He will no longer be needed as mediator. If I misunderstood I would appreciate you helping me clear this up. In a blog format, short articles are the norm, not long dissertations, otherwise you lose people. Therefore, when writing on a subject, it’s impossible to cover all the ramifications and implications of any given topic. This is what Bible commentaries are all about. I have my own, which I’ve been compiling from my own writings for the past 20 or so years, and it’s some 2000 pages long! This is because every biblical subject has a myriad subject threads that is related to a myriad other subject threads. It’s not uncommon that when I write a short article on any given biblical subject that some reader will ask me why I didn’t cover some other related subject. That’s because there’s usually not time or space to do so, and to presuppose on my part every question a thousand readers might have and to answer them in a short article would be an impossible task. Now to the point of your question. Just because I wrote that we enter the holy of holies through the blood of the Lamb in no way presupposes that I’m suggesting that we no longer need the Lamb, his blood, his righteousness, his advocacy as our Great High Priest. These other subjects simply weren’t within the scope of the present discussion, or else my blog article would have had to expand to be an epistle. Rev 21:23 The city had no need of the sun or of the moon to shine in it, for the glory of God illuminated it. The Lamb is its light. I hope this clears things up for you. Blessings. Yes I suppose it does a bit. Thank you for your patience.